During the evolution of land plants, the sporophyte generation has become increasingly more complex, both physiologically and morphologically. The gametophytes from the Rhynie chert demonstrate that during the Early Devonian gametophytes and sporophytes were more similar to each other than these generations are today. Some authors working with extant plant development suggest that the Rhynie chert gametophytes provide evidence of developmental genes being reassembled from the gametophyte phase and incorporated into the developmental pathways of the sporophyte (Floyd and Bowman, 2007). The comparison of developmental mechanisms based on various gene families in bryophytes, lycopsids, and seed plant lineages has already revealed some commonalities (e.g., among the MADS-box genes), as well as differences related to various plant structures. These morphological expressions can then be compared to structures that are present in fossils. This is another way that evidence from the fossil record can be used in understanding the morphological evolution that has led to the complexities in mul-ticellular plants that dominate the Earth today. While cladistic analyses suggest that the land plants are monophyletic based on the presence of multiple sporangia (the polysporangiophytes), the evidence from the fossil record may be interpreted in several ways. The conducting elements in many of these early plants have been interpreted as representing a protracheophyte grade of evolution. The diversity of these elements, however, brings up the question of whether or not conducting elements evolved more than once as a response to the selective pressures of a desiccating environment. Researchers on extant algae are still debating the relationships of the charophycean algae and which group is most closely related to land plants. Many systematists that work only with extant plants believe the fossil record is too incomplete to provide any information on the origin of land plants, but new discoveries continue to provide more data. Based on the diversity of conducting elements, the fossil record could be interpreted to suggest that land plants (hornworts, bryophytes, and vascular plants) became established in terrestrial environments several times and perhaps originated from a variety of charophycean green algae. 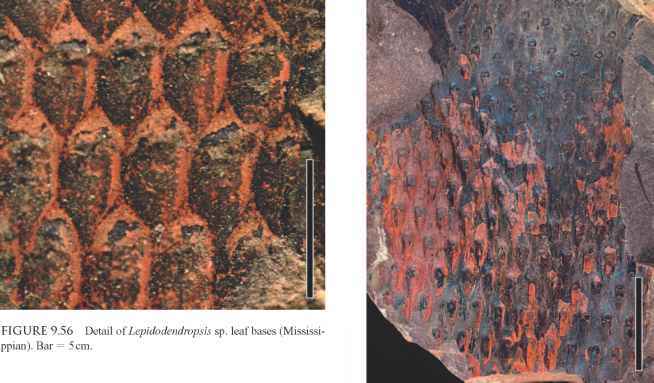 The fossil evidence for the lycopsid lineage shows that these plants were clearly differentiated from the other vascular plants (and remarkably modern!) as early as the Late Silurian (Chapter 9). Information on the earliest land plants and the earliest vascular plants continues to be amassed. Regardless of the degree of interrelatedness of these early land plants, how and when the necessary steps took place in the transition from an aquatic to terrestrial habitat will continue to be challenging questions for paleobotanists and neontolo-gists alike. And, again, it is an error to imagine that evolution signifies a constant tendency to increased perfection.